Take advantage of this unique opportunity to leave your mark at Hofstra University, celebrate a graduate, or remember a loved one by purchasing a commemorative brick on the Walk of Pride. Each brick will be placed in front of the James M. Shuart Stadium. You and countless others will be able to view your mark on Hofstra for lifetimes to come. Your brick purchase does not only leave a personal touch on the University, but immediately supports the needs of current and future students of Hofstra University by going towards The Fund for Hofstra. The Fund for Hofstra University is a vital source of unrestricted funds that helps the University attract the best and brightest students through scholarships and financial aid, expand academic offerings, recruit and support accomplished faculty, and enhance classrooms and other campus facilities with the latest technologies. We encourage you to take advantage of this exciting opportunity to demonstrate your support for Hofstra University and leave your lasting mark. WHAT WILL I GET BY CONTRIBUTING TO THE WALK OF PRIDE? You will support students and educational programs at Hofstra University. 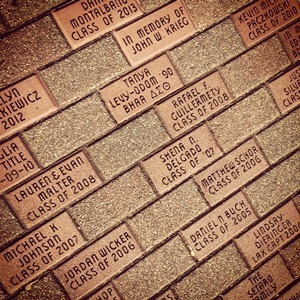 Your brick will be a highly visible and permanent testimony of your loyalty to Hofstra. Your contribution to the Walk of Pride is tax-deductible to the extent allowed by law. HOW DO I PURCHASE A BRICK IN THE WALK OF PRIDE? Order your brick online now. Walk of Pride order form print it out and mail.